Last year the Mass Appeal imprint expanded their media reach by adding a record label to their magazine empire. The record labels debut album was Run the Jewels 2, from hip hop producer/emcee group El-P and Killer Mike. So who would follow up such a mighty album? Fresno's own, Fashawn. Fash has been in the mixtape scene since 06 but he debuted his first indie album, Boy Meets World, in 09. It received critical acclaim from all sectors of the hip hop landscape: other emcees, producers, magazines and websites. The Exiled produced album hailed Fashawn as a young emcee with an old soul. He eloquently articulated the struggles of an adolescent growing up in Fresno. But he also provided aspirational themes that contrasted the darker subject matter. 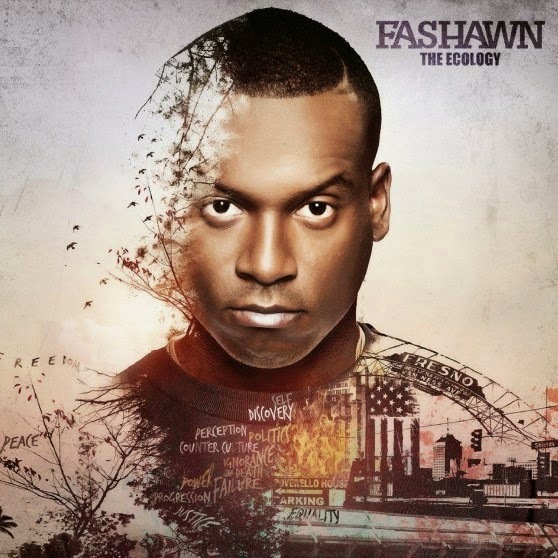 Even before he signed to Mass Appeal Records last year, Fashawn's sophomore album, The Ecology, was a very anticipated album. Fashawn's buddy Exile helmed most of the production duties, but producers like Alchemist and DJ Khalil also blessed the album. After Fash's debut LP was praised for reaching near classic status, the pressure was one to follow up with a steady sophomore album. The Ecology's intro track Guess Who's Back displays an emcee who has evolved so much in just a few short years. Fashawn shows control of his flow and delivers seamless bars that address his love of hip hop, his growth from the hood, his aspirations, friends who passed, view as a role model and signing to Nas' label. The stand out track for me is Something to Believe In. The DJ Khalil instrumental is actually an Aloe Blacc song (of the same name) that never made it out of the demo stage. It was just a raw track with instrumentals from Aloe Blacc's band, and Khalil gave it that hip hop soul. Fashawn says that he knew he had to step his game up. Not just because the beat was inspirational, but his label boss Nas would pen a verse as well. Both emcees spit top shelf rhymes and we have no choice but to sit back and stamp it with a classic seal. Golden State of Mind was the first single I heard. Exiled was able to lay down an instrumental that was very reminiscent of that 90s west coast sound. Channeling his inner DJ Quik, Exiled created a super smooth track that makes you want to hop in a 6 4 and cruise straight to the beach. Fashawn enlists fellow Californian Dom Kennedy and both ride the track with a nostalgic flow. Lyrically Fash keeps his word play simple and compliments the instrumental with steady bars. So did Fashawn conquer the sophomore slump? Si señor. People attest this jinx to the fact that you no longer have the element of surprise. Back in the day before you could become a YouTube rapper or throw your mixtape online, you couldn't reach that many people without a studio album. But once you did, people knew your name and your sound. Those that relied on gimmick raps were dead in the water after that. But Fash hangs his hats on raw lyrical talent and smart deliveries and an adaptable flow. Having the cosign from Nas also helps. Now that they will be working together in the same label (Nas as boss, Fash as artist) we can look forward to more Mass Appeal albums on the same level as The Ecology. And just like ecology is the study of "the relations of organisms to one another and to their physical surroundings", this album is a looking glass into Fashawn's hometown of Fresno. We see the overall social landscape created by years of underemployment, poor educational structures and rampant drug abuse. But Fashawn is also able to give us personal accounts of an atmosphere that breeds a cycle of poverty and addiction. Songs like Man of the House and Mother take us inside his four walls and paint an intimate portrait of his upbringing. Fashawn is only in his mid 20s and shows a range and intelligence of those twice his age. I look forward to see what the Cali emcee's next moves are, especially under the wing of Nas.